The Wire Megazine Concert Blog: Over $300,000 dollars raised in just 4 years for Sick Kids Hosptial. Over $300,000 dollars raised in just 4 years for Sick Kids Hosptial. Photo taken, submitted and inserted by Deb Draper volunteer. 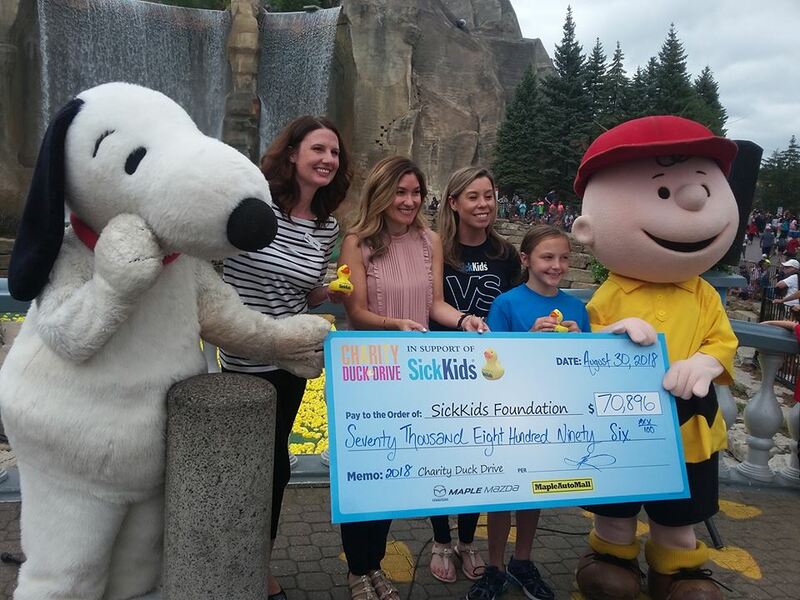 Sick Kids and Canada's Wonderland Cares held it's Annual Charity Duck Drive Campaign and I was honored to be a small portion of their success as 1 of the many volunteers donating their time to help make a difference in the lives of nearly 100,000 Plus children/patients. Once again in its 4th year, awareness and funds were raised all in support of SickKids in Toronto, one duck at a time. In the past 4 years, this charity event has raised over $300,000 for SickKids! From August 1 - 30, 2018, guests made an impact in the caring of children at SickKids by purchasing a Rubber Duck 1 for $5 or 5 for $20 and then tossing them into the Park's Royal Fountain on International Street. On Thursday, August 30, 2018, the first lucky duck selected from the Royal Fountain drove away the winner of the Grand Prize: a three-year lease of a 2018 Mazda CX-5, courtesy of Maple Mazda! and was acquired from this event's partners at Zanchin Automotive Group as a donation to The SickKids Foundation for the sole purpose of being a Prize in the 2018 Canada’s Wonderland Charity Duck Drive event. Additionally, CWL had a Second Prize for the second lucky duck plucked from the river: a five pack of 2019 Season Passes to Canada's Wonderland! The Hospital for Sick Children (SickKids) Toronto, Ontario is a health-care community dedicated to improving the health of children. Their mission is to provide the best in family-centred, compassionate care, to lead in scientific and clinical advancement, and to prepare the next generation of leaders in child health. PROUD TO ANNOUNCE that there were only a few volunteers myself included, Wonderland staff, Lisa Walker from The Sick Kids Foundation, alongside Sick KIds Embassador Lacy, Andrea Zankin from Maple Mazda, Snoopy and Charlie Brown present today. This season volunteers enjoyed spending hours squeezing ducks, chatting to patrons about "Trying their luck and to buying a duck and making a difference in the lives of many sick kids." Throughout the month-long campaign even in the 8-hour steady DOWNPOUR, myself included last week, we raised from August 1st to 30th a total of $70, 896.00 marking the grand total in 4 years, to over a whopping $300,000.00 plus raised! Snoopy, Human Resources Management Canada's Wonderland, Andrea Zankin of Maple Mazda, Lisa Walker Sick Kids Foundation, Sick Kids Embassador Lacy and Charlie Brown. in grade 1 developed a condition known as Hodgkin’s lymphoma. Lacy was a friendly, energetic and jumping (or flipping) for joy when you think of Lacey. However, after her mother Tanya noticed Lacey wasn’t her usual energetic self and found a lump on the side of her neck, Lacey’s family spent months searching for a diagnosis. They ended up in the Emergency Department at The Hospital for Sick Children (SickKids). Further testing revealed a diagnosis of Hodgkin’s lymphoma, a cancer of the lymphatic system. Lacey began chemotherapy in March 2015, resulting in many overnight stays at the hospital. But even while she was nauseous and tired, she would find the energy to participate in activities happening around the hospital. She especially enjoyed playing with the volunteers and making music videos on their iPads. In June 2015 she completed her fourth and final round of chemotherapy. As soon as she was well enough Lacey went back to gymnastics and started competing again, winning 3 medals in 2017. This past June marked 3 years in remission as a grade 5 student. Lacey is so eager to give back to the hospital that gave her the gift of health and hopes to use her experience to make a positive impact on the lives of other children. Even if just for 1 shift, disabled or able-bodied, you should give of your time or donate to this worthy cause and make the difference in the lives of over 100,000 children patients at Sick Kids Hospital right here in Toronto, you'll be glad you did!!! ROUTHE69 PRODUCTIONS PRESENTED COLD ETHYL with special guests Demolition Rage & Voice of Treason. Legendary Music Biz Photographer John Rowlands shares stories behind his iconic photos from the last 6 decades! thewiremegazine. Simple theme. Powered by Blogger.